Kanda Poha / Savory Flattened Rice is one of the most popular healthy breakfast/snack recipe from Maharashtra made with Poha/flattened rice and Onions. 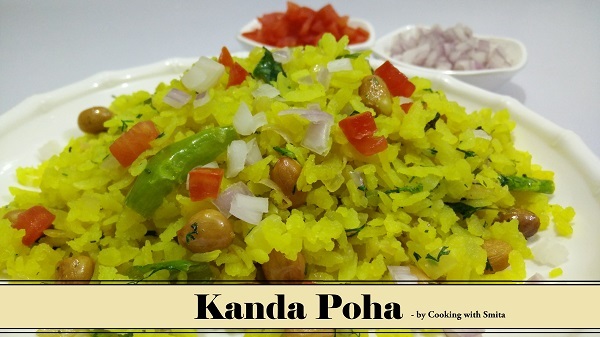 There are many recipes for making Poha, either with Potato or Onions or both. I have made this Poha using Onions. Learn how to make this healthy breakfast Kanda Poha at home. Take a pan/wok and heat oil over medium flame. Add Green chillies and Curry leaves in hot oil and sauté for about 30 seconds. Add Peanuts and sauté for about 1 & ½ minute. Now add chopped Onion and sauté for about 2 minutes. After 2 minutes add Turmeric Powder and mix well. Add washed Poha, Lemon Juice, Salt, Sugar and mix well all ingredients. Lower the flame, cover with a lid and cook for 2 minutes. Now add fresh coriander and mix well. Switch off the gas and serve. Serve Kanda Poha / Savory Flattened Rice with chopped Onion & Tomato.